Both this painting and RCIN 405078 show a great debt to Marco Ricci’s capricci, both in oil and in tempera on leather, which Canaletto would have been able to study in Consul Joseph Smith’s collection. 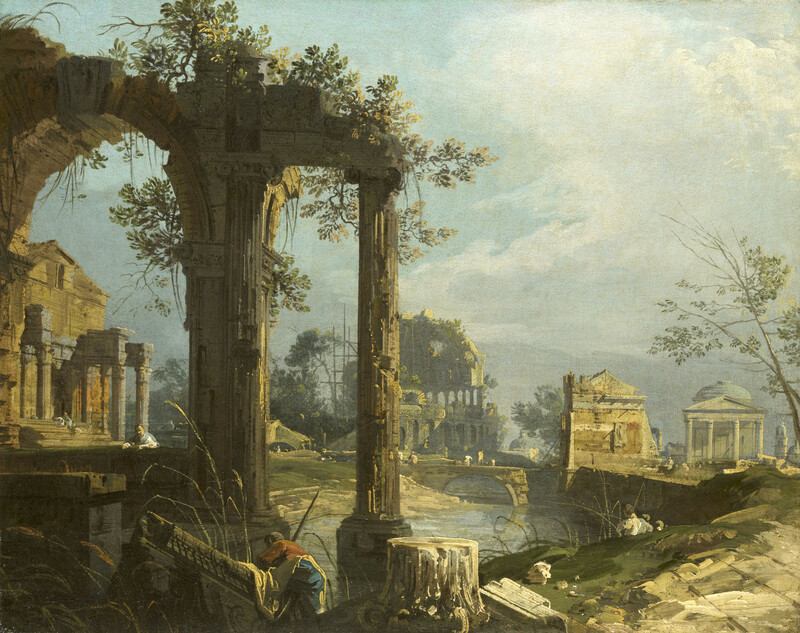 The compositions, with large ruined arch or arches in the near foreground, through which more ruins are visible, and the bringing together of a number of ruins in one scene, are found in Marco’s A Classical Ruin Capriccio (RCIN 406907) and A Ruin Capriccio with Roman Motifs (RCIN 406906). Marco’s capricci include contemporary figures at work, seemingly oblivious to their majestic surroundings, and often leaning away from us so that we cannot see what they are doing. His use of tempera on leather, possibly kidskin gives a vibrant, luminous quality to his capricci, which Canaletto has re-created here, with thick and liquid paint and a subtle interplay between ochres, yellows and blues. As in Marco’s paintings, brilliant touches of golden light pick out the fluting of the columns, the leaves of foliage and the long rushes in the foreground. While Marco focuses on ancient ruins of the Roman Empire, Canaletto includes reminiscences of Padua and possibly also Venice. The church or temple on the left of the painting here has been likened to the unfinished façade of San Marcuola in Venice, with the addition of a ruined portico resembling the Forum of Nerva in Rome. The arches in the foreground are Roman and the ruin in the middle distance is reminiscent of the Colosseum. To the right are a Roman bridge and a building resembling the famous gate of Padua, the Porta Ponte Corvo, also known as the Porta Liviana, completed in 1517. The scene has the rough terrain, low-lying rivers and canals and flatness of the landscape around Padua. The church on the right resembles a combination of the portico of San Simeone Piccolo in Venice with a copper dome in the shape of Palladio’s Villa Rotonda, Vicenza.